3T/4T - $29.99 Only 2 left! No, we're not asking you to let go of your anxiety and angst over a good hike in the mountains. We're asking you to let go of your irritation over this song and its franchise. We know, we know. Your kid has watched this movie two dozen times in the last week. They always laugh at Olaf's antics. They sing along with the beginning even when no one knows the words (something something moun-tain! ), and of course, every single time, they too call out "You hoo! Big summer blowout!" They know Frozen backwards and forwards and so do you. Not by choice, mind you, but from sheer exposure. You've got different snippets of the soundtrack running through your head every day. You begrudgingly laugh at Sven's shenanigans. Rest assured, There are so many other parents going through the same experience, we wouldn't be surprised if there were a support group out there for you. But since your kid loves it so much, you're bound to watch it for now. And talk about it. And play with the toys. Don't forget dress-up time. 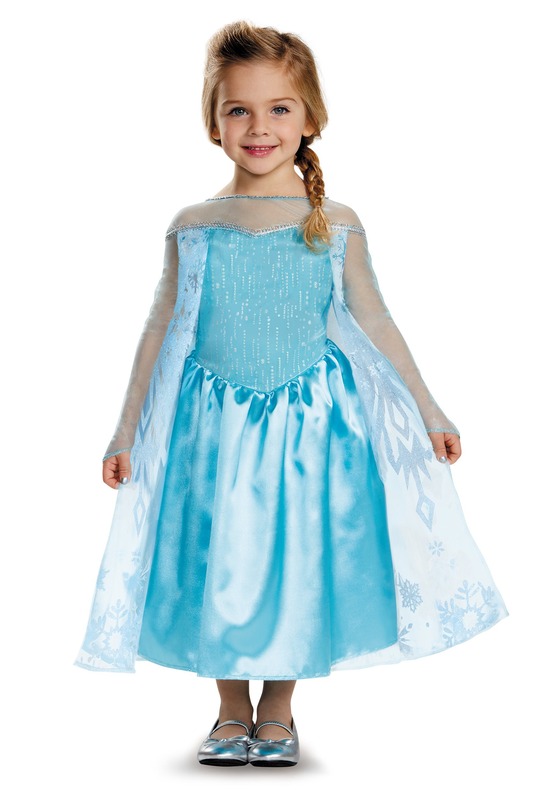 We've got this delightful little Frozen Elsa Classic Toddler Costume in Elsa's ice blue for your little Frozen fan. It's got glitter, a cape, and it's officially licensed. Play dress up with this little number and your toddler is sure to never let it go... well the costume. We hope they'll move on with their movie obsession sooner or later. For your sake. Perfect size and great price ! My daughter loves it and it fits perfectly ?? It was perfect, my daughter loved it!